Apple, fearing that Google Voice may cut into revenue and profit that earned by mobile service carrier and voice call provider, standalone Google Voice client app is not approved and released by Apple yet on the iPhone and iPod touch App Store (Note: Official Google Voice app for iPhone has been released). Without a legitimate Google Voice app, iPhone user cannot take advantage of the free calls provided by Google Voice to outbound destinations in U.S.A (including Alaska and Hawaii) and Canada. Previously, an application for VoiceCentral Google Voice clients, named GV Mobile were available briefly on the Apple App Store, before been taken down and removed from the App Store on the reason of duplicating features that the iPhone comes with, such as dialer, SMS and etc. iPhone users can still make use of Google Voice weblication (web app) which officially from Google, free, but is accessible through a mobile web browser. For iPhone owners who want a standalone Google Voice app, the developer of GV Mobile, Sean Kovacs had brought GV Mobile to Cydia Store via ModMyI repo, which as a consequence, is available only for jailbroken iPhone users. GV Mobile + 2.0 or 1.0 is not free though, although Google Voice service is free, and the official Google Voice app for iPhone, if approved, will likely be free of charge too. But the price tag of $1.99 is worthwhile for advanced features and ease of use the provided by GV Mobile +, where it supports and allows access to almost all features of Google Voice. 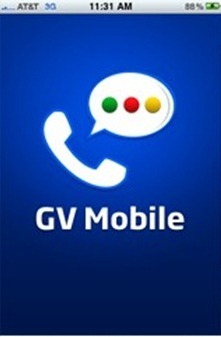 To install GV Mobile +, user will need to jailbreak iPhone, iPhone 3G or iPhone 3GS. Then GV Mobile + can be downloaded and installed from ModMyI repository via Cydia Store.